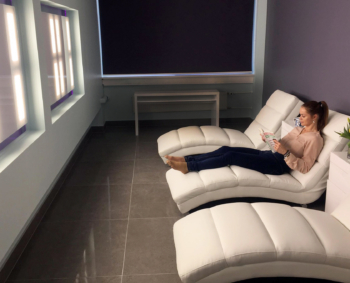 Light therapy or phototherapy is a procedure against fatigue, stress and mood drop using full spectre light that is similar to natural daylight. Lack of light influences children and adults resulting in health problems such as fatigue, frustration, stress, depression and over sensitiveness. It is recommended to use SAD (seasonal affective disorder) light therapy as an effective solution, as the therapy influences the organism’s biological 24-hour rhythm and regulates the level of the good mood hormone serotonin to improve mood. Light therapy influences people with depression or bipolar disorders positively as it helps alleviate increased symptoms during the darker periods of the year. The light therapy treatment takes place in a comfortable room with special lighting. The room is unique throughout the world. The procedure involves using light to influence the brain’s chemistry to reduce fatigue, irritation and stress. The effect of therapy is improved by keeping one’s eyes open during the light therapy, but it is not permitted to look directly at the bright light. Depending on the aim, colour therapy is an important part of the procedure. Colour therapy encourages the achievement of a person’s physical, emotional and psychic balance and augments the organism’s inner energy sources. Coach and health consultant Egle Eller-Nabi has joined our team. What services does the consultation department at the CIM provide? Can light make you happier? Light therapy impacts brain chemistry by reducing fatigue and stress. https://imk.cc.ee/wp-content/uploads/2018/04/valgusteraapia.egle_.jpg 1358 1810 cc https://imk.cc.ee/wp-content/uploads/2018/03/imk_logo-300x206.png cc2018-08-29 12:51:152018-09-24 13:41:20Can light make you happier? Egle Eller-Nabi shares her experiences as a coach and training consultant.